I, on the other hand, had the ultimate summer job: I was paid to drive exotic cars. Seriously. One summer during college, a Ferrari dealer employed me to bring customers their cars, which consisted of all the latest high-end sports and luxury models, plus a few Maseratis. Of course, I know what you're thinking: Holy crap! You once held a paying job? And the answer is: only briefly. You're probably also thinking that it sounds like a lot of fun. But that's not quite true. You see, if they hire the right guy, he never has any fun. Instead, he’s constantly thinking: Ohmygod that truck is getting close ohmygod does that guy see me? OHMYGOD YELLOW LIGHT! BRAKES! CHECK THE MIRRORS! And that was me, from open until close, unless I was driving the shop truck. Then it was more like: Hmm… I’m only doing 30. I wonder if I can drop it into Park. Friend: My job rocks! We got to leave at 4pm today! Me: Oh, that’s cool. I was once paid to spend four hours driving a Ferrari F430. 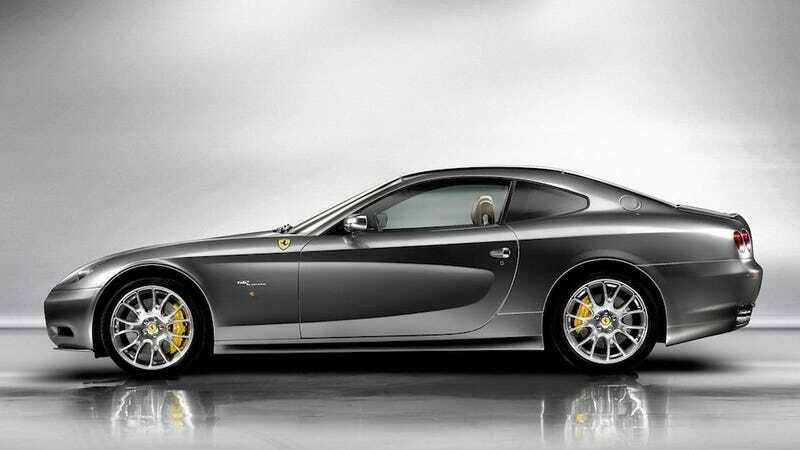 So I generally keep my mouth shut when the topic turns to Ferraris, except for right now, when I'm going to tell you about the Ferrari 612 Scaglietti. The 612 Scagelitti, for those who don’t remember, is a front-engined, four-seat Ferrari that is neither front-engined nor a four-seater. It’s not front-engined because the bulk of the engine is behind the front axle due to an engine bay so enormously long that it features, in addition to the engine, a spare tire, extra leather, a Frommer's travel guide to Italy, a lightly used Fiat 500, and an Italian family provided to help translate the owner’s manual. Also, it’s not a four-seater because the rear seats are so tiny that you’d hear cries of pain from anything you actually placed anything back there, including a USB stick. Now that we’ve covered all that, a brief review. Customer: I’m interested in an F430. Salesperson: I’m sorry sir, did you say 612 Scaglietti? Customer: Absolutely not! I said F430! Salesperson: Certainly, sir. Let me bring that 612 Scaglietti around for you. Customer: This is absurd! I’m leaving! Salesperson: Not a problem, sir. Can you take the 612 Scaglietti with you? Seriously: no one wanted it. That’s because while it looked normal from about the midpoint back, the front was so long and flat that it may have borrowed design cues from I-80 in Nebraska. In other words, it wouldn’t attract women. Not that any sports cars will. But this is the important thing about the 612 Scaglietti: once you got inside, you didn't have to look at it. You could forget about the fact that Silvio Berlusconi probably used the hood as a venue for some of the larger Bunga Bunga parties that wouldn't fit in his living room. You could just drive. And driving was what it did best. Handling and steering are great, especially when you consider the 612 is the same size as an Acura RL. And the F1 transmission was among Ferrari’s first that didn’t feel like you were riding along with a seven-year-old who was learning to drive stick without any previous exposure to a wheeled vehicle. Also, body roll was so controlled you felt like you were driving one of Ferrari's mid-engined sports cars. Of course, this notion went away the moment you realized right on red was out of the question because the hood was so long you couldn't pull up far enough to see oncoming traffic. Still, the exhaust note was 430-rivaling, and while ride quality was awful, you weren’t buying a Bentley. You knew that the moment you laid eyes on it. The 612's final strong point is its interior. In previous Ferrari models, interiors were created under the famous Italian principle of: Can't we just bolt folding chairs to the floor? This is proven by the fact that the 360's gauge cluster doesn’t actually specify which turn signal is on. But the 612’s interior has leather, navigation, an LCD screen in the gauge cluster, and – this one must’ve been hard for Ferrari – a center console that didn’t have an enormous gap under the stereo controls to reveal very cheap carpeting. Unfortunately, you must eventually climb out of the car and return to reality, which is that you’ve just had the drive of your life in a vehicle that would lose a beauty contest to a Panamera. But if given the choice, I’d rather have the 612. One reason is that early models are hovering dangerously close to $100,000, which makes them cheaper than many Panameras. But most importantly, because it’s a Ferrari. And that’s the stuff of summer job dreams. Doug DeMuro operates PlaysWithCars.com and writes for The Truth About Cars. He owned an E63 AMG wagon and once tried to evade police at the Tail of the Dragon using a pontoon boat. (It didn't work.) He worked as a manager for Porsche Cars North America before quitting to become a writer, largely because it meant he no longer had to wear pants. Also, he wrote this entire bio himself in the third person.